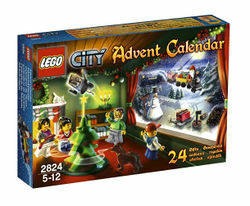 2824 City Advent Calendar is a LEGO City Seasonal advent calendar that was released in August 2010. It was available at the LEGO store, Target, or at Toys 'R' Us. Included are 276 pieces and six minifigures. The set typically features Christmas related elements like a Santa Claus minifigure or a snowman. Day 1: Snowman with broom. Day 2: Boy with sword. Day 3: Skateboard with ramp. Day 6: Girl with cat. Day 8: Dog with bowl. Day 10: Man with suitcase. Day 13: Toy fire truck. Day 14: Woman with bread. Day 15: Table with chairs. Day 18: Santa Claus with Brush. Day 19: Toy train car (red). Day 21: Toy train car (yellow). Day 24: Santa Claus with toy train engine. It comes with six minifigures instead of nine. It includes two Santa Claus minifigures instead of one. Many of the gifts are mini toys. Instead of being objects from around the community, most of the items are objects from around the house. Some of the gifts are mini versions of real LEGO sets. This is a description taken from LEGO.com. Please do not modify it. (visit this item's product page) The holidays are coming to LEGO® City, one gift at a time! Unwrap an adventure during the first 24 days of December! Countdown to the holidays with a new LEGO® City minifigure, vehicle or accessory every morning! Deck the halls of LEGO City with buildable holiday novelties! Open a window containing a build for December 1st through December 24th! Builds inside including a Christmas tree, fireplace and Santa’s train set. A scene from the calendar. Facts about "2824 City Advent Calendar"
The holidays are coming to LEGO® City, one gift at a time! This page was last edited on 9 January 2016, at 06:32.